Is LP making percussionists' lives easier by turning the traditional conga on its head? If you play your set on stands or need to tune up your set in super-quick time and demand sounds and playability of the highest order, then frankly these Top-Tuning Classics seem to make perfect sense! A clever idea that will be of real use to some players. Good sounds and build quality. If you don't need the top-tuning option then there are already a lot of other good congas out there. In these modern times in which we find ourselves, many companies' research and development departments constantly scratch their heads whilst musing on how they're going to make their products even better. LP's reputation for top quality percussive innovation is well charted, but this time it's gone right back to 'brass tacks' and re-examined one of the most fundamental aspects. For as long as most of us can remember, the only real option for the tuning of congas has meant tweaking the tones with a spanner underneath the tuning bolts. 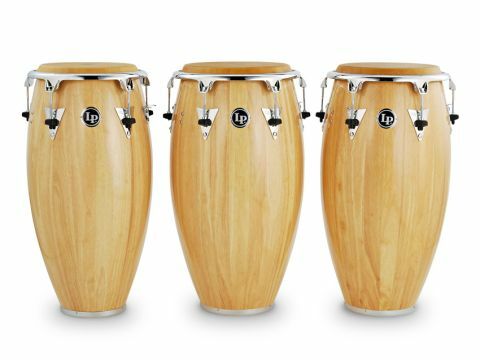 LP has now flipped the whole process around with it's revolutionary Top-Tuning Classic congas. LP's hugely successful Classic series congas were actually the first that the company produced, but these feature a different slant on the original Classics. They're stave-constructed from substantial Siam Oakwood and finished internally like regular modern Classics, but when tuning them you now go in from the top. The drums stand 30" tall with significantly broader 'bellies' than a lot of other models, and this is particularly noticeable on the Tumba. The upper internal portion of each drum is reinforced with fibreglass for added strength, but make no mistake, these are heavy drums! The beautiful Oakwood finish is nicely complemented with all-chrome hardware and this includes the new tuning system. The extended collar hoops sport a series of self-levelling tuning screws that sit in v-shaped 'ears' attached underneath the hoop and the hex-head screws are tightened from the top into self-aligning 'floating' threaded inserts. As you tighten each screw there is a direct 'straight line' pull downwards resulting in lovely, even tuning. You can tune these drums easily and in record time with the included fold-out hex key (or any similar, widely-available implement) and the combination of superlative shell, low mass hoop and top-notch natural rawhide head is a winning formula. The tuning 'ears' are low enough that they don't get in the way of your strokes and an impressive tuning range is possible with each drum in the range. The Oakwood provides a super warmth to all tones, with the tumba singing out at even the lowest tunings and the mid and high ranges complementing the tonal range beautifully. You can crank the tunings higher than you might expect without fear and the downward pull on each screw is secure and somewhat reassuring. With so many congas already currently on the market, available with a myriad of different materials and construction methods (not to mention virtually any kind of finish you could possibly want), you get a sense that there's possibly enough choice already out there. LP now offers the player a further practical option with these new 'top-tuners'.